Thursday, April 11th 1878 I helped do the work till about ten oclock. Then I dressed to go to town. Win came over and went back when I went over. I went into [Monquandts?] and got our watches giving my note for them. I got a new black dress for Hatt and went up to Townsends gallery to order pictures for Baily. I cut the waist to Hatts dress in the afternoon. Mrs Neill spent the afternoon here. I worked all the evening sewing the trimming to Hatts apron. Was very tired tonight. Friday April 12th 1878 I sewed all day long and got a fair start on the dress. I finished up the apron in the evening. I was very tired. 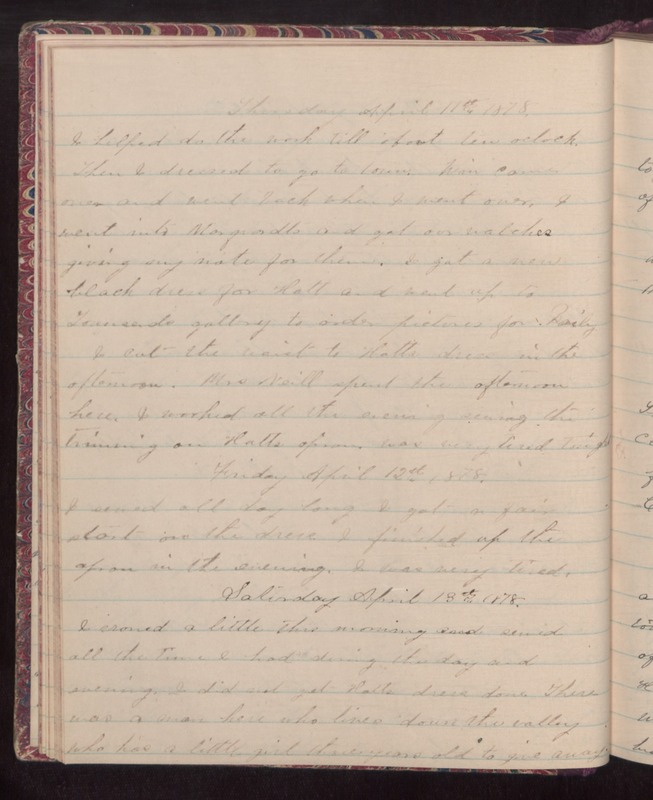 Saturday April 13th 1878 I ironed a little this morning and sewed all the time I had during the day and evening. I did not get Hatts dress done. There was a man here who lives down the valley who has a little girl three years old to give away.